The Mind-Body Diabetes Revolution is the first book to show how stress, depression, and anger affect blood sugar. It's also the first to provide a proven, step-by-step health program to help the millions of people with diabetes manage their disease. Until now, this life-changing program was available only to patients at Duke University Medical Center, but The Mind-Body Diabetes Revolution makes it available to everyone who needs it -- diabetic people and the millions at risk for developing the disease. Over the past forty years, little has changed in the treatment of type 2 diabetes. Diet, exercise, and medication are still the three primary methods used to control blood sugar. Yet diabetes is reaching epidemic proportions not just in the United States, but also in other countries all over the world. Now, after twenty years of research, Dr. Richard S. Surwit -- a leader in the field of the psychology of diabetes -- adds the vital fourth component to treating diabetes: a revolutionary mind-body program that lowers blood sugar levels and dramatically reduces the disease's serious, damaging side effects, which can include painful nerve damage, heart disease, impotence, eye problems, and kidney ailments. The Mind-Body Diabetes Revolution explains how thoughts and beliefs influence a person's emotions and moods and shows how these can translate into chronic anger, cynicism, anxiety, and depression -- all of which increase your blood sugar level. But, with compelling case studies and a powerfully effective step-by-step six-week program, Dr. Surwit demonstrates how you can learn to manage the emotions and stress that lead to elevated hormones and higher blood sugar levels. After he explains the mind-metabolism connection so that you see how it works in your own body, Dr. Surwit provides self-tests and reflective quizzes to test your personality type and decide on the best -- and easiest -- psychological techniques to help you lower your blood sugar level, and keep it low. Then he helps you develop the best long-term mind-body program for your needs and shows how to use the planner to keep track of your progress. 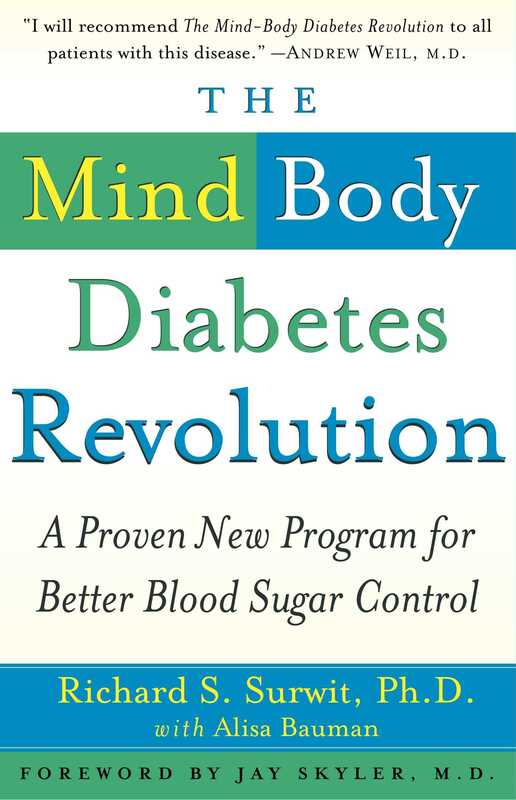 An invaluable aid to your overall well-being, The Mind-Body Diabetes Revolution helps you enlist your own mind and body as powerful allies in controlling your diabetes, and enjoy greater general health as a result. Two of my grandparents had diabetes. My father's father had diabetes from the time he was a young man and died at the age of fifty-nine, when I was only two years old. My mother's mother came down with it in her fifties. I still remember my grandmother, who died when I was ten, giving herself insulin shots. Both my grandfather and grandmother died of heart disease, the major cause of death among patients with diabetes. Because both of these grandparents were immigrants and raised their families during the Great Depression, they attributed their diabetes to the terrible stress of their lives, so I too always assumed that diabetes was somehow related to stress. I studied how stress affects high blood pressure, migraine headache, and Raynaud's disease (poor blood flow in the fingers and toes). In the late 1970s, shortly after I moved to Duke, I ran into a young endocrinologist, Mark Feinglos, who had also studied at McGill. He wanted to know if I had any psychological techniques that might be useful for treating diabetes. I had completely forgotten about diabetes, the disease that had killed my grandparents and the disease for which I likely carried at least some of the genes. Although I had assumed that stress was as important in diabetes as my grandparents thought, I did not really know it to be true scientifically. I decided to find out. Working with Dr. Feinglos, I set out on a research program that has spanned almost a quarter-century. My research group and others at universities around the world have conducted numerous studies on thousands of patients and animals to understand better how stress and other psychological factors influence this disease. The results of this research have proven that my grandparents were right: stress, depression, and a person's general psychological state greatly influence blood sugar in every individual with diabetes. These mental states may even determine whether genetically susceptible people develop diabetes in the first place. Although research on the importance of psychological factors has been published in the top scientific journals, it has not found its way into most diabetes treatment programs. To this day, most people with diabetes are still treated with the same three program components that have been used for the past fifty years: diet, exercise, and medication. Patients are provided with some training in nutrition, told to exercise regularly, and given oral medicine or insulin, or both. Few treatment programs address the important psychological factors involved in blood sugar control. The Mind-Body Diabetes Revolution gives you the fourth important component of diabetes treatment in a detailed step-by-step program. You'll learn how to use the power of your mind to control your body better. The psychological techniques in this program have been proven at Duke University Medical School and elsewhere to improve blood sugar control, and the different components of this program have been tested in clinics around the country in studies involving hundreds of patients. We have shown over and over again that once you know why your blood sugar remains high, you will be able to address the emotions that may aggravate your condition. Before we get into the program, let's first take a closer look at your metabolism, the rate at which your body burns up or uses blood sugar (glucose). • If one of your parents developed type 2 after age fifty, your risk of developing diabetes is 1 in 13. • If both of your parents had type 2, your risk of developing diabetes is 1 in 2. • If your father had type 1, your risk of developing diabetes is 1 in 17. • If your mother had type 1 and you were born before she turned age twenty-five, your risk of developing type 1 diabetes is 1 in 25. • If your mother had type 1 and you were born after she turned age twenty-five, your risk of developing type 1 diabetes is 1 in 100. To get your blood sugar under control, you first must understand the inner workings of your cells, hormones, and organs. You also must understand that what's wrong inside your body is not your fault. Blaming yourself and feeling guilty can actually worsen the condition by making you feel depressed and anxious. To prove to you that you didn't cause your condition, let's take a journey deep inside your body. Often one of the first symptoms of diabetes mellitus is frequent urination, produced by high blood sugar. Ancient physicians noticed that in patients with this condition, the urine often tasted sweet (hence, diabetes, meaning frequent urination, and mellitus, meaning honey). Diabetes develops when body cells cannot process glucose, a simple sugar that serves as the primary fuel for all cells in the body. Your body converts most of the food you eat into glucose, fats, and proteins during the process of digestion before burning it as fuel. Let's say you just ate a meal. You chew your food and break it down in your mouth, mixing it with saliva. You swallow. Blood vessels in your mouth, stomach, and intestines absorb the sugar from your food into your bloodstream. Your pancreas, an organ below your stomach, senses this rise in blood sugar. This important organ responds by secreting substances that aid digestion and several hormones, including the hormone insulin. Produced in clusters of beta cells in your pancreas called the islets of Langerhans, insulin helps control your metabolism. In a healthy person, the beta cells in the pancreas send out just enough insulin to allow the blood sugar to be processed by the body as needed. Insulin acts like a key to unlock the doors of muscle and other body cells and allow glucose in. If you eat more food than your body requires at the time, insulin allows this excess energy to be stored by the liver, muscles, and fat cells. In people with diabetes, however, something goes wrong. In people with type 1 diabetes, the beta cells in the pancreas are destroyed by the body's own immune system and can no longer produce any insulin. ardIn type 2 diabetes, the problem is somewhat more complex. The pancreas produces insulin -- sometimes more than normal. But the insulin doesn't work properly. It's as if the cells in your body have all changed their locks, and insulin can't get them to open their doors and let in the sugar. This is called insulin resistance, and it's often how diabetes starts. The result is the same: the sugar remains in the blood in high concentrations, setting you up for a number of health problems. When you have insulin resistance, your pancreas senses that your blood sugar is high and responds by producing even more insulin. Scientists believe that either this constant strain on the pancreas or the chronically elevated blood sugar itself can wear out your pancreas, which becomes unable to release enough insulin to regulate blood sugar. Ultimately, many patients with type 2 diabetes develop an inability to produce normal amounts of insulin. Whatever has gone wrong inside your body, the blood sugar doesn't get to where it needs to go. It remains high in the blood for longer than normal. Though your kidneys eventually flush the sugar out into your urine, high blood sugar brings on a host of problems. PREDIABETES. Also called glucose intolerance, prediabetes means that your blood sugar is higher than normal but not high enough to place you in the diabetic category. About 16 million people have prediabetes (17 million have full-blown diabetes). METABOLIC SYNDROME. Also called syndrome X, this refers to several conditions that often occur together. They include obesity, insulin resistance, diabetes or prediabetes, hypertension, and high blood cholesterol. TYPE 1 DIABETES. Type 1 diabetes is an autoimmune disease where your immune system attacks the beta cells (insulin-producing cells) in your pancreas and wipes them out over a period of time. It develops during childhood and makes insulin shots a necessity. TYPE 2 DIABETES. Type 2 tends to develop in adults and used to be called adult-onset diabetes. Today, however, younger and younger people, including teenagers, are developing the disease. This type of diabetes is really a spectrum of different diseases. For some people, the pancreas overproduces insulin, and cells fail to respond to it. (See insulin resistance below.) In others, cells respond normally to insulin, but the pancreas doesn't secrete enough of it, because the pancreas doesn't completely sense the correct blood sugar level. INSULIN RESISTANCE. This refers to your body's inability to use the insulin it produces. Lack of exercise, obesity, and a high-fat diet make insulin resistance more likely. HYPERINSULINEMIA. This may start with an overproduction of insulin, which may encourage cells to stop recognizing the hormone, which leads to producing even more insulin. High insulin levels increase your tendency to store fat, so they contribute to obesity as well. High blood sugar triggers health problems in the kidneys, eyes, heart, and nerves. Several studies have shown that blood sugar may be even more important than cholesterol levels or blood pressure in predicting heart disease and premature death. In fact, blood sugar is a major contributor to other ailments, such as high blood cholesterol and stroke. Many people who die of heart disease may have gotten those clogged blood vessels from mildly elevated blood sugar. • NERVE DISEASE. High blood sugar seems to damage the nerves, which can cause numbness, pain, and tingling anywhere in the body. When high blood sugar damages nerves around the organs, it alters the message relay system between the brain and organs. For example, nerves in the digestive tract may fail to tell the intestines to contract, which can cause constipation and incontinence. Damage to the nerves controlling the heart can leave diabetic patients susceptible to dangerous heart rhythm changes that lead to sudden death. Diabetes-induced nerve damage is also a leading cause of impotence in men. • HEART DISEASE. People with diabetes are two times more likely to suffer a heart attack as those without it. This is particularly risky in women with type 2, who have a three to four times higher risk of heart disease than women without diabetes. Diabetes increases levels of fats circulating in the blood, which get stuck along the linings of arteries, creating plaque that can eventually clog the arteries. Stiffer, narrowed blood vessels make the heart work harder to pump blood, which raises blood pressure. Higher pressure causes more damage to the arteries, creating a vicious cycle. • STROKE. People with diabetes are two times more likely to suffer a stroke as those without it. As blood sugar levels rise, blood becomes thicker, increasing the chances of a stroke. Just as blood vessels surrounding the heart can narrow and become damaged by high blood sugar, so can the smaller blood vessels in the brain. High blood pressure, which is also associated with high blood sugar, weakens arteries in the brain, causing them to bleed. • EYE DISEASE. Diabetes is the leading cause of blindness, and half of those with diabetes develop eye disease. People with diabetes are twenty times more likely to go blind than those without it. When the blood vessels in the eyes get damaged from high blood sugar, they weaken and leak, damaging the retina and clouding vision. Eventually, this can even destroy eyesight. • KIDNEY DISEASE. Diabetes is the leading cause of kidney failure: people with diabetes are forty times more likely to suffer kidney failure than those without it. With diabetes, the kidneys must work overtime to filter excess sugar out of the blood. Eventually, the blood sugar destroys the cells in the kidney that filter the blood. In addition, many people with diabetes also have high blood pressure, which further damages the kidneys. • DIABETES. High blood sugar damages the pancreas, so it is possible that patients whose blood sugar that runs in the high-normal range may be damaging their pancreas and pushing themselves further toward diabetes. For those who have diabetes, high blood sugar also eventually destroys the beta cells that secrete insulin. Blood sugar is not the only culprit in diabetes. High insulin levels, or hyperinsulinemia, common in early type 2 diabetes, may be as bad as high sugar levels. Excess insulin may also damage the heart, blood vessels, and nerves, and it can increase blood pressure. Many people don't take diabetes seriously. Your doctor may have diagnosed you with diabetes after you complained of seemingly benign symptoms. Perhaps you felt more fatigued than usual or had frequent headaches. Until it starts to hurt your health, the condition seems more like a nuisance than an actual threat. On death certificates, diabetes is rarely listed as the cause of death. Instead, people who die with diabetes are said to have died of kidney failure, heart attack, stroke, and other organ diseases. Nonetheless, those diseases were probably caused by diabetes. The good news is that research done in the last ten years has shown that keeping tight control of your blood sugar can help reduce and possibly even eliminate these health consequences. So whereas many people live in dread of cancer, diabetes may actually be worse than cancer for some people. Diabetes significantly decreases life expectancy. Many people with cancer may actually be able to live longer than people with diabetes. The difference between cancer and diabetes is that, with appropriate medication and lifestyle change, you can do more to manage your disease than someone with cancer can. If you've discounted the serious ramifications of diabetes, you're not alone. Until recently, even the medical and scientific community paid little attention to type 2 diabetes. For most of the twentieth century, researchers focused on ways to cure type 1 diabetes, the type that develops during childhood. The discovery of insulin in the 1920s allowed children with type 1 to live into adulthood. Even so, because regular insulin shots don't completely mimic the natural rises and falls of insulin, blood sugar is still hard to control, and people with type 1 often die prematurely of diabetic complications. Until recently, type 2 diabetes, which tends to develop in adulthood, garnered little attention. Since the 1990s, however, the number of people affected by the disease has skyrocketed. (I'll explain why in a minute.) Today, type 1, which affects about 500,000 people in the United States, seems like a minor public health problem compared with type 2, which affects close to 20 million Americans and is growing rapidly in the United States and around the world. In fact, type 2 diabetes is starting to affect children, something unheard of just a decade ago. Diabetes isn't just an American problem. It is a world health crisis. Experts have predicted that the Chinese will have 200 million people with type 2 diabetes by 2020, with India close behind. Those grave numbers reflect only people with full-blown diabetes. Countless numbers of other people have a condition we now call prediabetes, and still others are genetically prone to diabetes but have not yet developed the disease. And still other people who test normal on typical blood sugar exams at a physician's office and who technically don't have "diabetes" have day-to-day blood sugar levels that are high enough to increase their risk of serious health complications. Your blood sugar level is vitally important to your well-being. Many people probably have higher average blood sugar levels than they should, and most people don't know it. Unlike blood pressure and cholesterol, doctors rarely check blood sugar levels unless the patient reports diabetes-like symptoms. That's why the American Diabetes Association estimates that as many as 5 million people have undiagnosed diabetes. As more and more research emerges on the health risks of poor blood sugar control, we're learning that what we once thought of as a normal reading may still raise the risk for disease. Blood sugar levels include a large gray area between what's considered healthy and what's considered diabetic. The lower your average blood sugar levels are, the lower is your risk for disease. The higher your levels, the higher your risk is. Diabetes is a frustrating disease. You may be doing everything right to control your blood sugar: you watch what you eat, exercise, and may even be taking medication. Yet your blood sugar may still remain out of control. Both type 1 and type 2 diabetes are complex disorders. Certain genetics make some people more prone to diabetes than others. But even for people with such genetics, something in the environment seems to trigger the onset of diabetes. For instance, if one identical twin has type 1 diabetes, there's a 50 percent chance that the other twin will develop it too, but we don't yet know why one develops the disease while the other does not. As little as 100 years ago, thrifty genes helped people survive. Nearly every society around the globe led an existence characterized by periodic feasts and famines. The poor survived on potatoes, rice, and bread. Meat and cheese were considered luxuries. Calories were scarce. As a result, people tended to be much smaller and leaner than they are today. People who had the "thrifty" genotype tended to survive such harsh living conditions and pass on their genetics. In the past, women whose bodies were able to store more fat during lean times tended to get pregnant and lactate, passing on their thrifty genes to their offspring. Women whose bodies tended to burn calories at a high rate and not store fat usually couldn't get pregnant during lean times, so they didn't pass on their genetics. This is why obesity genes are so common. It is also why most fertility symbols in primitive societies were figurines of obese women. Our ancestors knew that obese women could produce and raise children. Your fat cells are actually endocrine cells that secrete a hormone called leptin. The fatter you are, the higher your leptin level is. Leptin has many different roles in controlling body weight, including regulation of appetite and metabolic rate. It also tells the brain whether there is enough stored energy to allow a woman to become fertile. Women with very low body fat, such as some athletes, and women with severe eating disorders cannot become pregnant. Leptin is nature's way of preventing a woman from having a baby she can't feed. Over the thousands of years of human civilization, this feast-or-famine existence has resulted in more and more people today possessing not just one but many genes related to diabetes. In fact, societies that lived through feasts and famines most recently have the highest rates of diabetes today. African Americans, Native Americans, Asians, Polynesians, Aborigines, and Latin Americans now have the highest rates of diabetes. They have a strong genetic predisposition developed after years of starvation and subsistence on few calories and very little fat. As these societies switch to an Americanized lifestyle, with its excess fat and calories and a decrease in physical activity, they are also suffering greater rates of diabetes. The Pima Indians provide a perfect example. Until the early 1900s, the Pimas lived off the land, farming and fishing. Living in the Southwest desert, they battled frequent droughts, sometimes feasting, sometimes starving. Those who survived such harsh conditions tended to have the ability to store fat when food was available. As little as 100 years ago, Pimas were a lean race of people in whom diabetes was rare. When settlers destroyed the agrarian lifestyle that the Pima Indians had used to survive, during the early 1900s, they began to starve. The federal government began supplying lard and other high-fat foods to the Pimas. Today on the reservations, food is as plentiful as anywhere else in the country, and like many other Native Americans, the Pimas have exchanged their active lifestyle for a relatively sedentary one. Today, nearly 100 percent of Pimas are obese, and over 50 percent have type 2 diabetes, one of the highest rates in the world. Their genetics haven't changed, but their lifestyles have. A group of researchers led by Dr. Eric Ravussin, then at the National Institutes of Health, found a group of Pima Indians living across the border in Mexico. They were the genetic cousins of the Arizona Pimas, but they had retained their traditional agrarian ways: they exercised more and ate far fewer calories. Few of these people were obese, and diabetes was practically nonexistent. This proves the important effects lifestyle has on obesity and diabetes. Here's another example. At Duke, we've done quite a bit of research on mice (which share 80 percent of human genes) to help us understand the genetics of diabetes and obesity. We have found that like humans, different strains of mice carry different numbers of thrifty genes. When fed a low-fat diet, most strains of mice are lean and have normal blood sugar levels. Certain strains of mice, however, are genetically prone to balloon and develop diabetes as soon as the fat content of their diet is raised to the relative level that most Americans consume (40 percent calories from fat or more). According to the thrifty gene theory, a number of different genes work together to slow the metabolism, promote fat storage, spike blood sugar and insulin, and make cells resistant to insulin. Over time, many different thrifty genes have evolved, each contributing to the thrifty genotype in a slightly different way. It's unlikely that one or even several genes will be discovered and deemed completely responsible for diabetes and obesity. Many genes are involved. Research from my own laboratory has shown that chronically high insulin levels, common in early diabetes, shut down the body's ability to burn fat, which lowers overall calorie-burning capability. High insulin levels block the body's ability to release fat stores. Consequently, high insulin levels have been linked to obesity and the development of type 2 diabetes. The relationship between the body's tendency to store fat and its susceptibility to develop diabetes is well known, but we do not completely understand how fat storage leads to diabetes. The most likely explanation is that the more fat one stores, the more fat can compete with glucose as a fuel in most cells, causing a surplus of glucose to remain in the blood. As a result, the body suffers chronically from high blood sugar. Exactly how severe your diabetes becomes depends largely on how many thrifty genes you have, how much you exercise, and how and what you eat. Some people can control their blood sugar simply by watching what they eat or by losing weight. Others may need to add exercise to the mix. And still others may have so many thrifty genes that nothing -- not even oral medication -- will get blood sugar completely under control. These people often require additional insulin even if their pancreas is still working. No matter how badly you've been walloped by genetics, however, there's still hope. Even if you never completely control your blood sugar, every little bit you do helps to slow the progression of complications. Calories are plentiful in this country. The cheapest food in America tends to be highest in calories and fat. In the 1800s, the poor lived on potatoes and rice. In the 2000s, the lower socio-economic groups eat junk food and fast food. Family-style and fast food restaurants supersize their meals, making it possible for an individual customer to consume thousands of calories in just one meal consisting of a soda, fries, and a burger. That's two to three times the calories you need. I'm no exception even though I certainly know better. Not long ago, I was traveling with my family. We got to the airport around dinnertime and had an hour to kill so we walked around the airport looking for something to eat. There were no nutritious choices, and we eventually settled on fried chicken. When we got to Philadelphia, my daughter said she was still hungry. A McDonald's was within walking distance of our hotel, so we went there, and she ordered fries, which my wife and I nibbled on too. The restaurant was packed with teenagers who were drinking sodas and eating fries, loading up on hundreds of excess calories and fat. But my family and I do this only occasionally. For many Americans, this is a daily diet, setting them on the road to gaining weight and developing diabetes. Type 2 diabetes will never go away all by itself. Our bodies will never genetically alter themselves to adjust to our new lifestyles. Because type 2 diabetes does not usually develop until after people reach reproductive age, diabetes genes will not be weeded out of the population by evolution. People with type 2 rarely die before childbearing age. People with one or more thrifty genes continue to pass on their genetics. The life-changing program in this book will help you use your mind to manage your blood sugar better. That said, this program is no substitute for the three old standbys in diabetes treatment: diet and weight loss, exercise, and medication. Let's take a closer look at each. High-protein, high-fat diets are probably dangerous for people with blood sugar problems. Many people with diabetes may have some kidney problems, and high-protein diets, which stress the kidneys, can be very harmful. As it turns out, people with blood sugar problems generally do well on high-carbohydrate diets -- as long as the fat content is very low. Our research at Duke has clearly shown that high-carbohydrate, low-fat diets will quickly lower blood sugar and promote weight loss. Patients on such diets have found them to be very effective for controlling diabetes. Our research at Duke has also shown that blood sugar problems arise only when simple carbohydrates and fat are mixed together. Fat taxes the pancreas and induces hyperinsulinemia and insulin resistance, allowing the simple carbohydrates to raise blood sugar. I suggest you follow a low-fat diet. It will help you manage your blood sugar and is better for your overall long-term health. Some people with diabetes do just fine on the American Heart Association's 30 percent fat diet, but the best results for most people with diabetes are found in diets that restrict fat even further, such as the programs of Dean Ornish, Pritikin, and the Rice Diet. These diets usually obtain less than 10 percent of their calories from fat. If you have diabetes, you may have heard that you should eat foods that are low on the glycemic index. The glycemic index is a measure of how fast your body absorbs the food you eat and raises blood sugar levels. The body absorbs simple carbohydrates such as sugar, potatoes, and rice very rapidly, which is why these foods are high on the glycemic index. The body absorbs high-fiber carbohydrate foods more slowly and protein and fats even more slowly. These foods are lower on the index. For people with diabetes, lower-glycemic-index foods usually lead to lower blood sugar levels after a meal, which is why some people have suggested that overconsumption of high-glycemic-index foods leads to high insulin levels and diabetes. Research does not support this theory. Many studies have shown that if the fat content in the diet is low enough (usually less than 10 percent), very-high-glycemic-index foods have no adverse effects on blood sugar, insulin, or weight. In one study that we conducted at Duke, we fed overweight women either a low-fat diet consisting of 50 percent calories from sucrose (table sugar), which has a very high glycemic index, or no sugar at all. After six weeks, both groups lost the same amount of weight and had the same blood sugar and cholesterol levels. Furthermore, people with diabetes who went on the Rice Diet, which consists of numerous high-glycemic-index foods but very little fat, regularly lose weight and improve their blood sugar levels. So as long as you keep fat to a minimum, you probably do not have to worry about the glycemic index. If you are overweight, however, you will want to lose a few pounds. This is usually easy to do on a very low-fat diet. Losing as little as 5 to 10 percent of your total weight may dramatically improve your blood sugar control by making your cells more sensitive to insulin. This will help preserve the beta cells in your pancreas. To do so, you must eat fewer calories than your body burns for energy. Once you lose the weight, you must eat roughly the same number of calories that your body burns. It's really a simple formula. The weight-loss industry has a terrible track record, with most people quickly regaining whatever weight they lose. Most people succeed in losing weight, but they don't keep it off. Part of this failure stems from unrealistic goals. Rather than aiming to reach a "healthy" weight, most people strive for a "cosmetic" weight loss, which is often impossible to achieve. They therefore become discouraged and give up. If you weigh 200 pounds, you may need to lose only 10 to 20 pounds to improve your blood sugar. But most people who weigh 200 pounds try to lose much more -- 50, 60, 70, or more pounds. This type of goal is hard to maintain. To succeed at weight loss, you must aim for a healthy weight. To get there, you must follow a program that you can maintain. The only way to keep the weight off is by keeping up the habits that you used to lose the weight in the first place. You'll find a mind-body program to help you lose weight in Chapter 10. Regular exercise helps lower blood sugar for numerous reasons. First, it helps you to burn more calories than you eat. Second, exercise helps you deal with stress and boost your mood, which, as you'll learn in coming chapters, is key in keeping blood sugar under control. Third, regular exercise improves your health and prevents some of the complications that occur with diabetes, such as heart disease. Both aerobic exercise and strength training are important for people with diabetes. Aerobic exercise is the most effective way to burn calories and is also important in preventing heart disease. Strength training will increase your muscle mass, which increases your resting metabolism and makes your cells more sensitive to insulin. This in turn will lower your overall blood sugar and insulin levels, which allow your body to burn fat more easily. Lower insulin levels will also decrease your appetite. If you have diabetes, it is critical that you consult your doctor before you begin any exercise program or diet program. You need to know that your body will tolerate what you are about to start, and you should have your doctor monitor your progress to make sure that it is having the desired effect on your condition. Diet and exercise may not be enough to bring blood sugar under control. That's where medication comes in. Over the past ten years, numerous new medications have become available that can make a major difference in diabetes control. You need to take medication if diet and exercise don't work for you. Further, if you have diabetes, you should make sure that you are receiving the correct medication that you require. If in doubt, consult a diabetes specialist. You can find one by a referral from your regular doctor or through the American Diabetes Association (1-800 DIABETES or www.diabetes.org). You'll also find some helpful information about diabetes medications in Chapter 11. My first diabetic patient was Janice, whom I met many years ago when she was in the hospital because of severe complications from diabetes. She was on medication and had been doing everything right, but her diabetes was not responding. Within a week, I taught her the program that you will learn in this book. By the end of the week, her blood sugar was under much better control. Since then, I've taught hundreds of other patients the same technique with similar results. The program works by tapping into your mind-body connection. As early as the seventeenth century, the famous physician Thomas Willis attributed the onset of diabetes to a problem with the nerves. Over the past hundred years, we have learned that the hypothalamus controls most metabolic functions. Hormones released from this area of the brain control appetite, metabolic rate, fat storage, and blood sugar. The key hormones involved in controlling blood sugar are also the key players in the body's response to stress. Thus, by controlling your response to stress, you can help regulate your metabolic control. Though you cannot simply will your blood sugar to normal, your metabolism is not beyond your control. You can learn certain techniques that will help put you in the right frame of mind for optimal blood sugar levels. By learning to take yourself from an anxious to a relaxed state, from a depressed mood to a happy one, from an angry state to a calm one, you can significantly influence blood sugar control. The Mind-Body Diabetes Revolution will give you a little wiggle room. Adding psychological strategies to your current regimen will help you mentally relax a little and allow you to enjoy life more without suffering blood sugar surges as a result. It can even help you finally get blood sugar under control when all else has failed. Remember that you will still have to stay on your strict diet and take any medication that is prescribed for you. Turn to Chapter 2 to discover the power of your mind and metabolism connection.